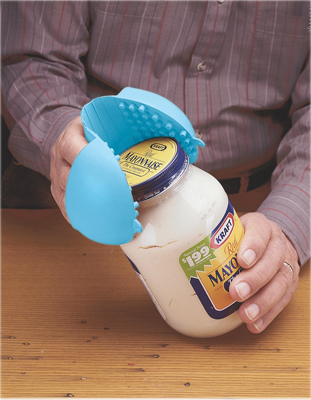 Aids to daily living including jar and bottle openers. 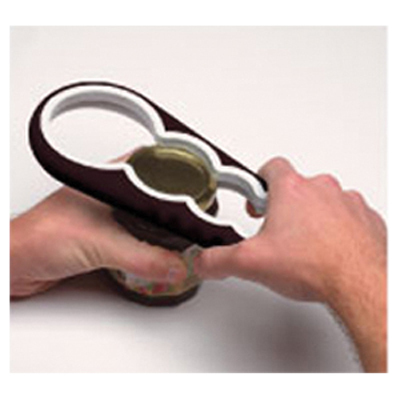 Select the appropriate opening size, grip firmly and twist. Soft rubber gasket creates a firm grip. Dimensions: 4" x 1" x 12"
Pockets fit thumb and fingers. Works as a gripper to unscrew tight jars. Secure grip on hot, cold, or slippery items. Product color is sky blue. Dimensions: 8" x .5" x 8"